First buy some fresh or frozen fillet of salmon, defrost if necessary, and cut it into appropriate serving sizes – smaller for an appetizer and larger for a main course. We purchased two fillets from S&R at say PHP400 each so each portion worked out to roughly PHP100 each. 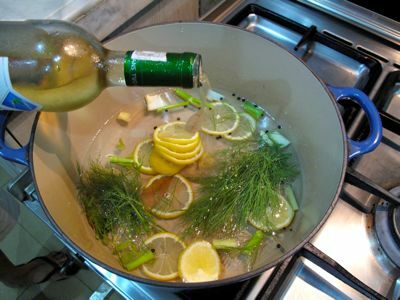 Next make a poaching liquid. I added equal parts water and white wine enough cover the slices of salmon. 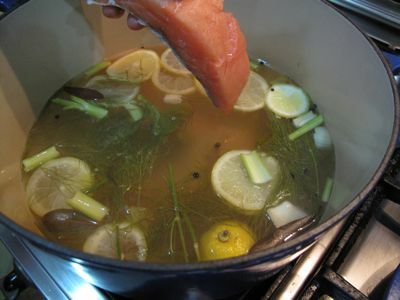 Then add some slices of lemon, sprigs of dill, some Italian parsley, celery, leek, bay leaves and peppercorns, then cover it and bring to a boil, lower the heat, and simmer for a few minutes. 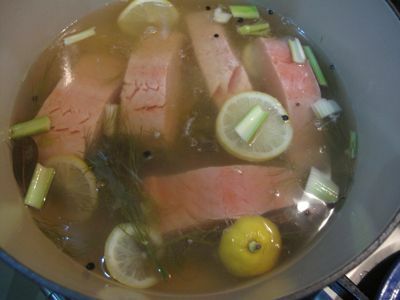 Place the salmon slices in the poaching liquid. Here’s a hint, don’t put it in as photographed above, as you have a tendency to “crack” the meat a bit, just lay the fish on a wide spatula and spoon, supported from “below” or the skin side and gently slide it into the poaching liquid. Put the cover back on, and make sure the water does NOT return to a boil. Poach for roughly 8-10 minutes, depending on the size of the slices. I like the fish to be moist, so I would err on the underpoached rather than overpoached side. 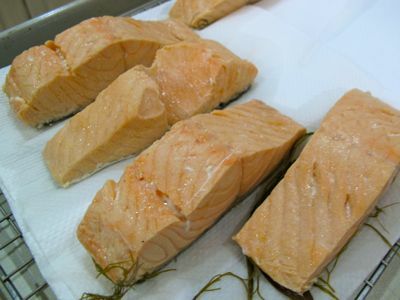 Gently poke the salmon after say 6-7 minutes; it should still be a bit soft and will yield to the gentle pressure. It should take another minute or so… Then carefully remove the salmon from the poaching liquid and lay them on a plate or a pan lined with some paper towels and cool. Then chill in the fridge for at least 1 hour before serving. For the “sauce” I simply used one small container of plain yoghurt (greek yoghurt would be nice too), some chopped dill, some minced cucumber without seeds, a hint of dijon mustard, salt and pepper and a touch of lemon juice. I made this in advance and kept it in the fridge as well. 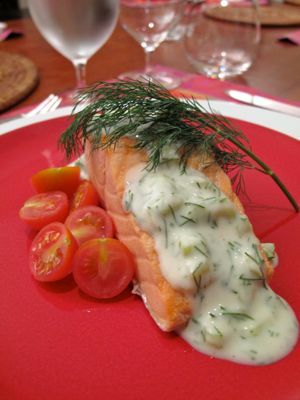 Right before dinner, assemble the salmon on a plate, add some yoghurt sauce and a sprig of dill, and that’s it! So incredibly easy, all made in advance. Wow! i will try it on Easter Sunday. by the way, after putting the salmon i will not wait for the water to boil before removing the salmon? Just as I am looking for a sallmon recipe for Good Friday….this looks really good. wandetingfoodie, no, don’t bring the water back to a boil. The fish will “poach” in the liquid, and as the fish meat is quite delicate, it does cook despite the lack of a boil. However, BEFORE you put the fish in, the water should have been simmering and very hot. chinachix, and leftovers are great if flaked and made into a sandwich filling or to mix into a green salad, so make extras to begin with to maximize utility of the poaching liquid. Nice one MM. Now I know what to do with the salmon I bought. It’s been in the freezer for about a week and tomorrow it’ll be history. Hey YEL: are you the one who was “loveless” last Valentine’s Day? If you still are…you could also win over your date by making Salmon Wellington. …a bit more work but worth the effort! You can prep the components way ahead of time. If she is not watching her weight, you could do the Welly using puff pastry. But if she is watching her weight, you could use phyllo instead. I’ve been searching a good alternative to the usual pan-seared or baked salmon. Thanks for this MM. Was wondering though, would this work also if I just got the filleted version without the skin or does the skin of the salmon add a little bit of OOMPH? This is excellent for a brunch buffet since it doesn’t have to be kept warm. Thanks, MM! As it’s Good Friday this is perfect I’m off to the store to buy some frozen fillet of salmon as this looks so easy to make and I want something nice and easy today. do you serve it straight from the fridge or bring it to room temp? we get back from our cruise. I use leftover salmon (flaked) for fried rice with peas, cubed carrots, and other usual suspects…then dill and saffron. Deleche!…A-ha, this time, ako ang may FRESH salmon, MM, ikaw naman ang FROZEN, hahahah!!! I am definitely gonna try this recipe! Thanks, MM! wow!!! pictures look so appetizing especially the one right after they were out of the poaching liquid. my daughter loves salmon and so this is a keeper. have to head out to S&R for my supply. thanks again MM for your generosity. 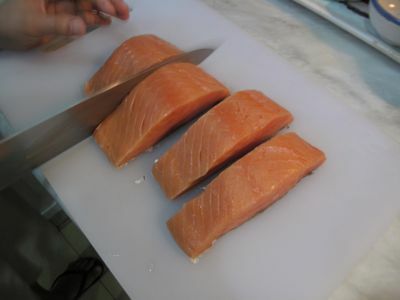 To atbnorge : Deleche!â€¦A-ha, this time, ako ang may FRESH salmon, MM, ikaw naman ang FROZEN, hahahah!!! @uniok, anong isang minuto frozen na? FLASH din ako kung kumain ng salmon, lol!Walang isang minuto—so, paano ko ma-win over ang guy kung ganoon akong kumain, ha betty_q? lol! Thanks MM! Will definitely try it once we bring in some fresh salmon again! MM, after putting the fish in the poaching liquid, do I turn off the fire, and let the hot liquid cook it? since I do not need to bring the liquid back to boil? Thanks. Thanks for this MM! :) May I know if your “yoghurt sauce” can also be used for grilled salmon? To atbnorge : inisip ko kasi , sobrang lamig dyan lol…annual ave. temp ata dyan 6C or lower.. Tries this recipe but unfortunately, my daughter still prefers the way I make it. I soak the salmon fillet in soy sauce, dill and a pinch of ground pepper for 10 minutes. Fry on Tefal pan. We like ours a bit undone in the middle. I also make a red curry dish with salmon fillet. Market Update: Fresh Produce, Buy Now!! !